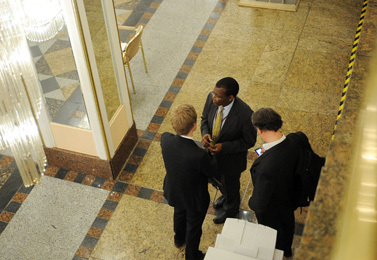 AWG-KP 7 concludes its work at 10:46 pm. The AWG-KP 7 concluded its work at 10:46 pm and adopted conclusions on, inter alia, Annex I emission reductions, legal matters, flexibility mechanisms, LULUCF, potential consequences of response measures and "other issues" covering greenhouse gases, sectors and sources. Parties mandated the new AWG-KP Chair John Ashe (Antigua and Barbuda) to prepare two documents for the next session in June 2009, namely a proposal for amendments to the Kyoto Protocol under Article 3.9 (Annex I further commitments) and a text on other issues, such as LULUCF and the flexibility mechanisms. 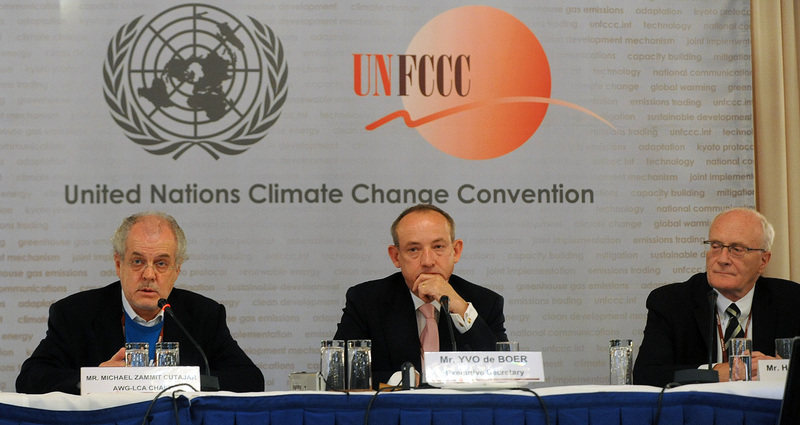 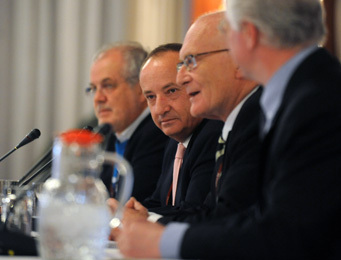 Photo: AWG-LCA Chair Michael Zammit Cutajar, UNFCCC Executive Secretary Yvo de Boer, and AWG-KP Harald Dovland during an afternoon press conference. The AWG-LCA 5 concluded its work at 7:28. 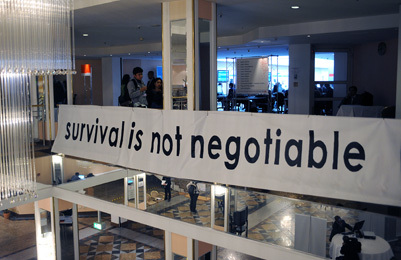 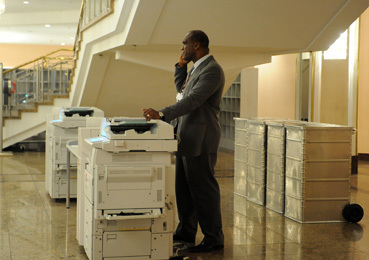 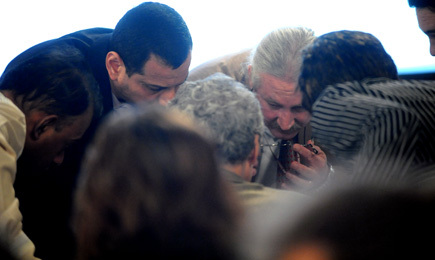 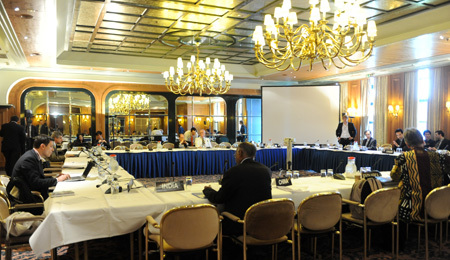 It decided to convene two additional meetings in 2009, in August and November. 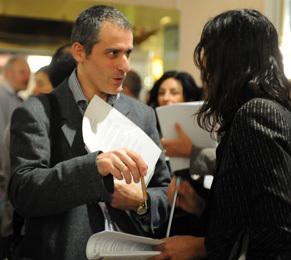 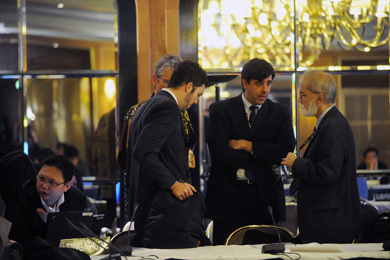 Based on the mandate given to him in December 2008, Chair Michael Zammit Cutajar will also prepare a negotiating text for AWG-LCA 6, which will take place in June 2009. 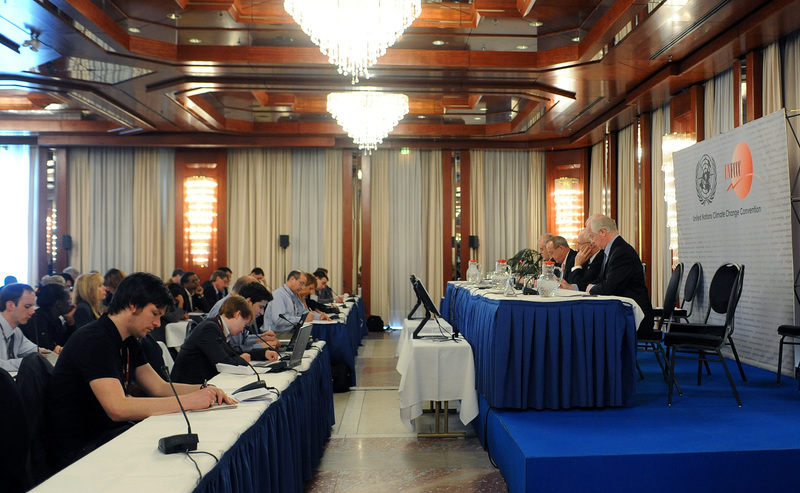 The AWG-KP 7 closing plenary will convene later in the evening to adopt conclusions on issues including legal matters, Annex I emission reductions, LULUCF and flexibility mechanisms. 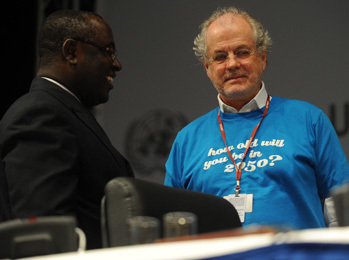 Richard Kinley, UNFCCC Deputy Executive Secretary, and AWG-KP Chair Harald Dovland at the conclusion of the session. 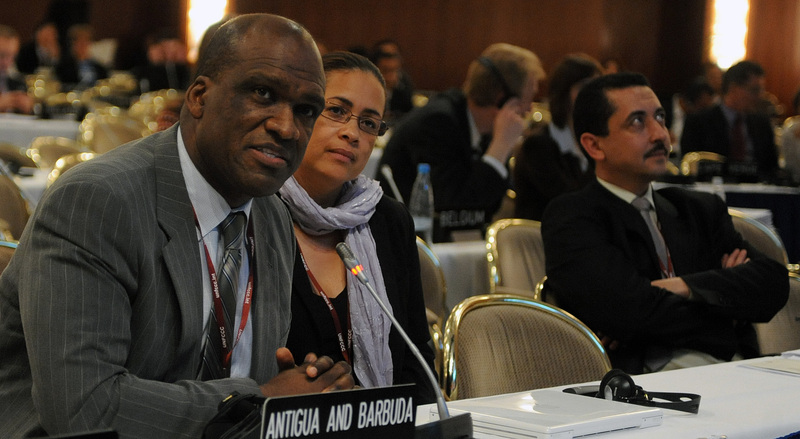 Incoming AWG-KP Chair John Ashe, Antigua and Barbuda, stressed time constraints, and emphasized the need for leadership for Copenhagen. 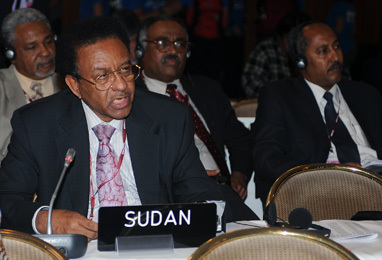 Sudan, for the G-77/China (left), highlighted the AWG-KP's very clear and definite mandate to reach conclusions on Annex I parties' emission reductions. 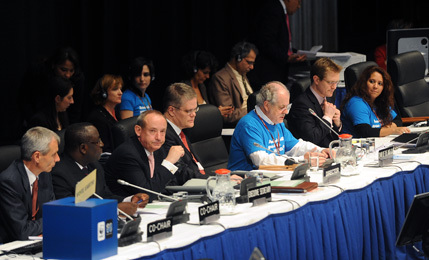 He expressed “extreme disappointment” over the lack of substantive discussion on Annex I parties' emission reductions, noting that the AWG-KP is now behind schedule. 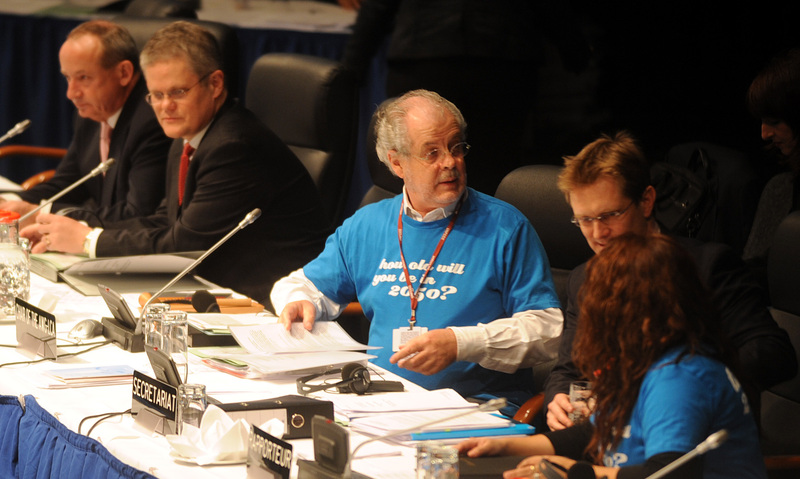 AWG-LCA Chair Michael Zammit Cutajar wearing a "how old will you be in 2050?" 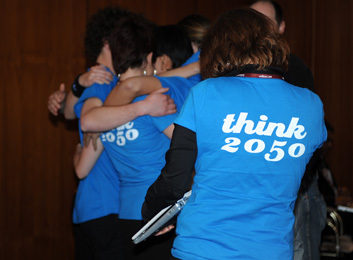 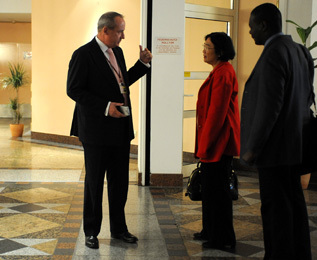 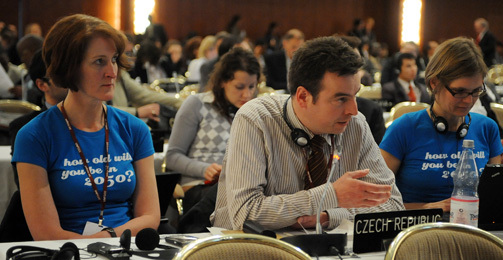 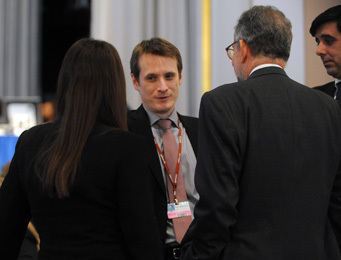 t-shirt (left) and Maas Goote, the Netherlands, speaking with UNFCCC Executive Secretary Yvo de Boer (right). 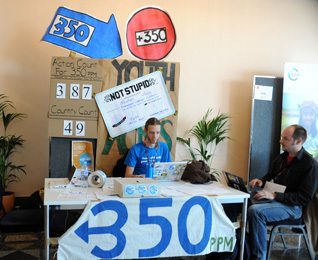 Youth asked who would be the big country to be the first to "take the jump" on climate change action and make history (left photo). 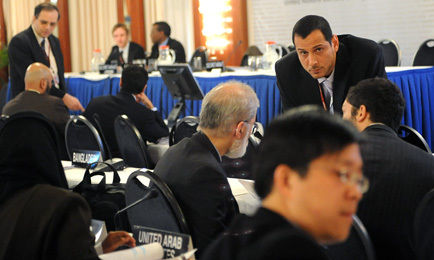 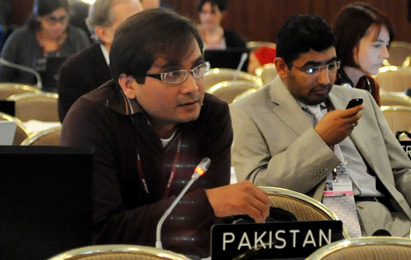 Farrukh Iqbal Khan, Pakistan, (left photo) intervening during the closing plenary. 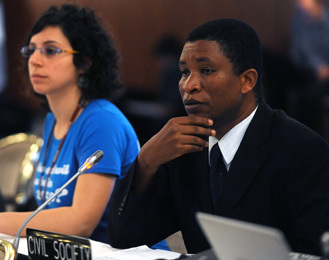 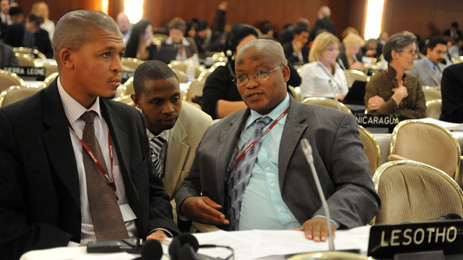 Lesotho, for the LDCs (right), highlighted the adverse effects of climate change on the most vulnerable countries and called on developed countries to provide sufficient funds for the LDC Fund. Maas Goote, speaking for the EU, noted AWG-LCA’s progress in clarifying such concepts as REDD, a registry, technology transfer and the role of carbon markets. 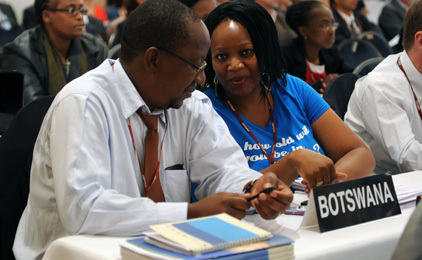 He also underlined the need to urgently operationalize these ideas. 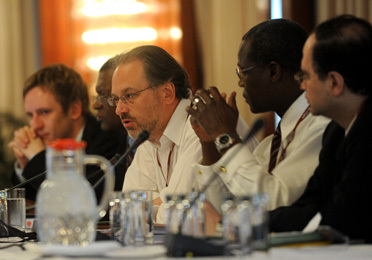 Adapatation Contact Group Chair William Agyemang-Bonsu, Ghana, and Chair Zammit Cutajar (right). 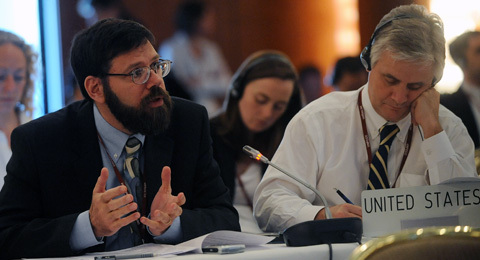 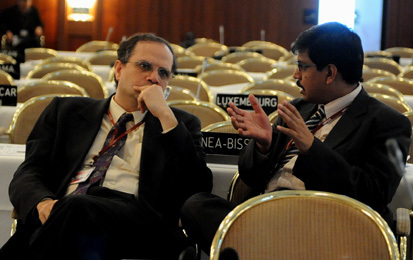 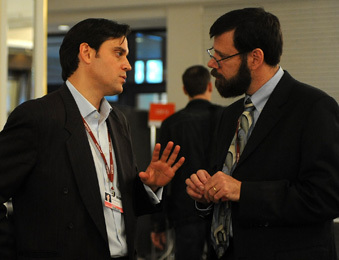 Jonathan Pershing, US (left), said a pragmatic approach is needed, noting that pragmatic does not mean reaching a lowest common denominator agreement, but to the contrary. Chair Zammit Cutajar gavels the meeting to a close. 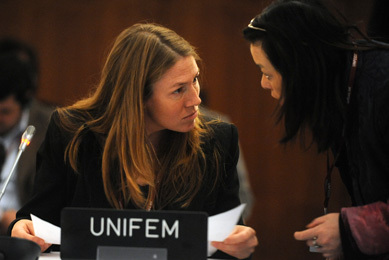 Tracy Raczek, UNIFEM (left), underlined that gender concerns should be taken into consideration with regard to both effects of climate change and balanced participation in decision making. 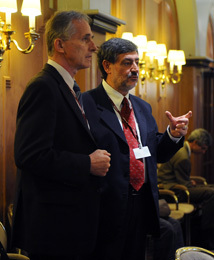 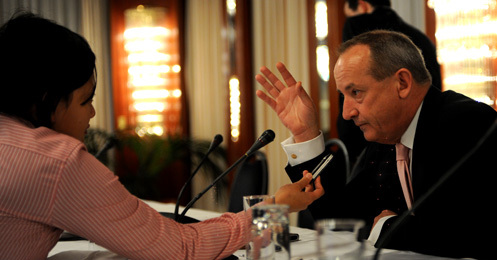 Andre Odenbreit Carvalho, Brazil (left). 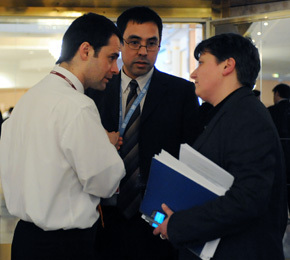 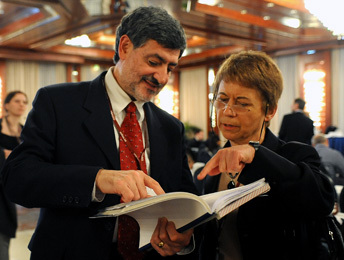 Annabella Rosemberg, International Trade Union Confederation (right), noted that concerns of social justice, particularly employment issues, should be taken into account. 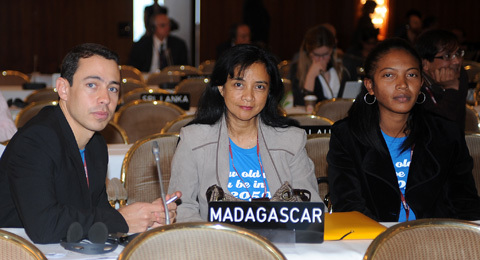 Delegates from Madagascar (left photo) and Kevin Conrad, Papua New Guinea, and Jonathan Pershing, US (right photo). 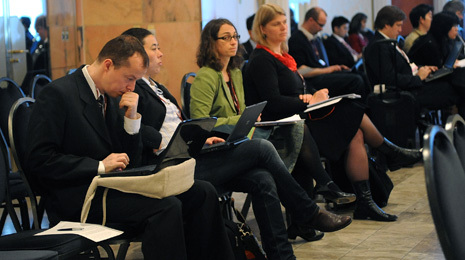 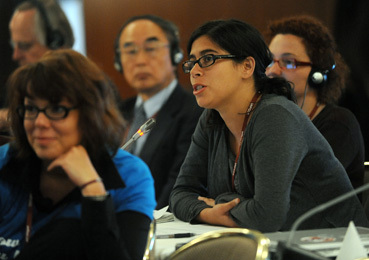 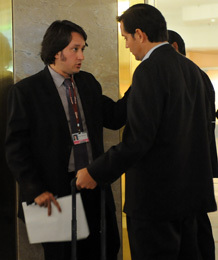 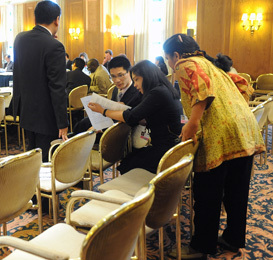 G-77/China members consulting (left photo) during the contact group on potential consequences. 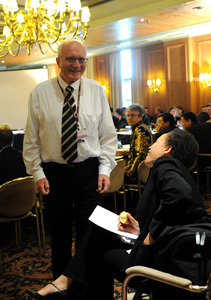 Andrea Garcia Guerrero, Colombia, and Alf Wills, South Africa (right photo). 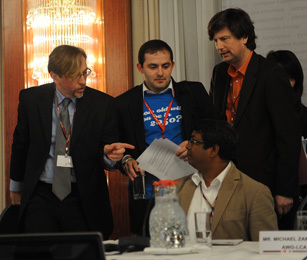 Members of the UNFCCC Secretariat with Contact Group Co-Chairs Paul Watkinson, France, and Mama Konate, Mali, during the contact group on potential consequences. 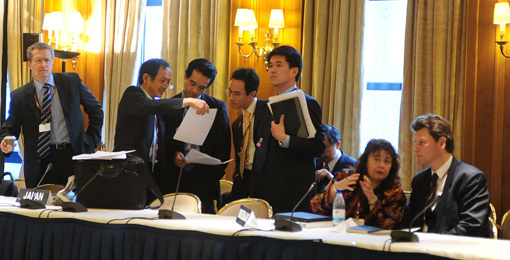 Delegates reviewing draft conclusions (left). 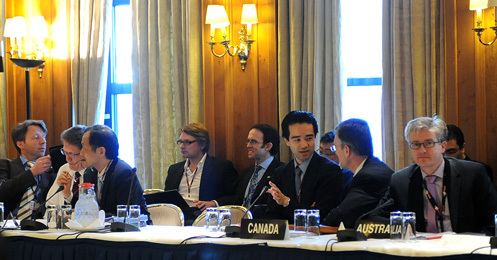 Informal consultations on legal matters and Annex I emission reductions. 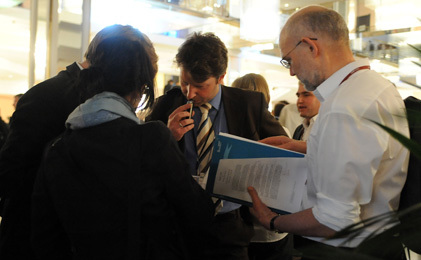 Ian Fry, Tuvalu, facilitated informal discussions on the scale of emissions (left photo). 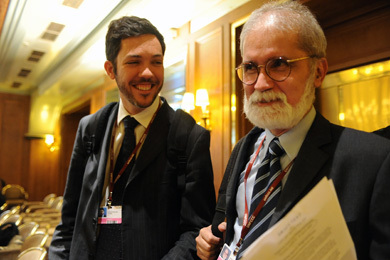 Leandro Waldvogel Giraldelli and Jose Domingos Gonzalez Miguez, Brazil (right photo). 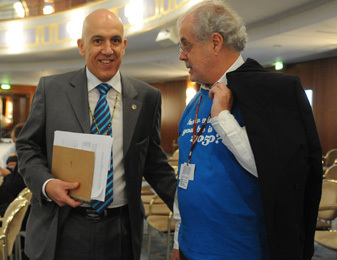 AWG-LCA Chair Zammit Cutajar shows off his shirt (left). 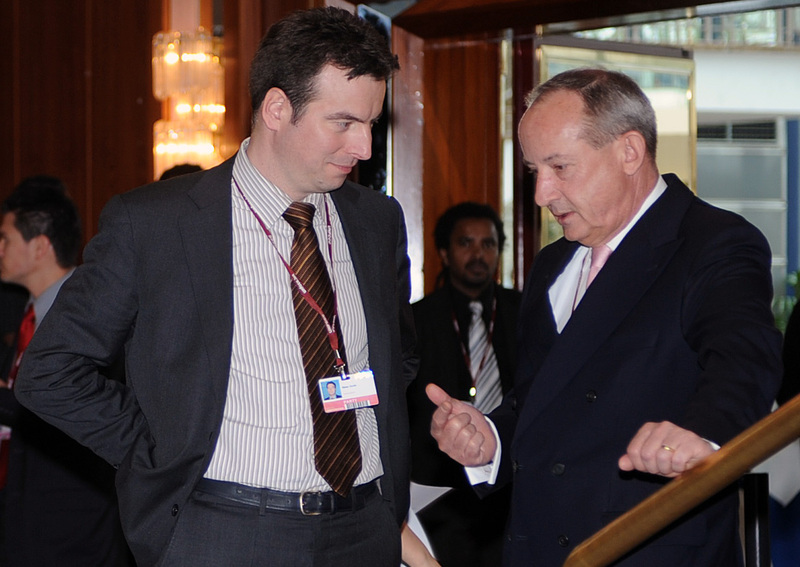 AWG-LCA Chair Michael Zammit Cutajar, UNFCCC Executive Secretary Yvo de Boer, and AWG-KP Harald Dovland (right photo). 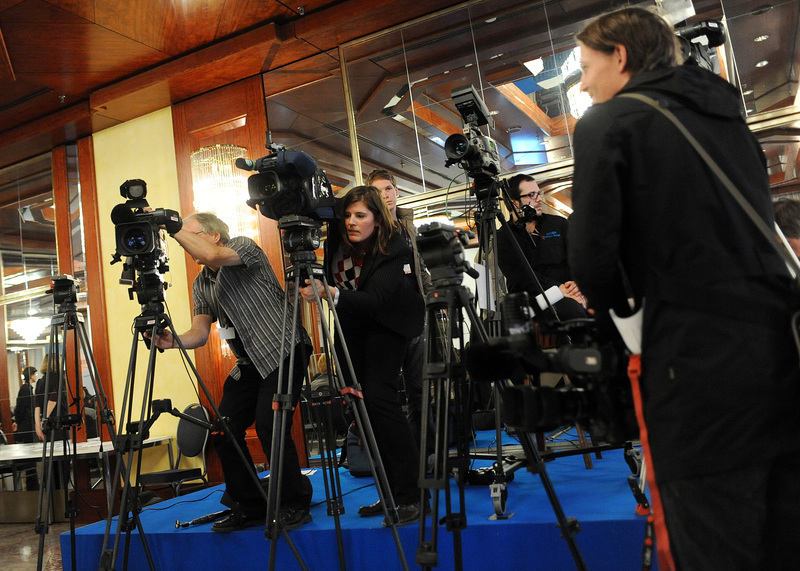 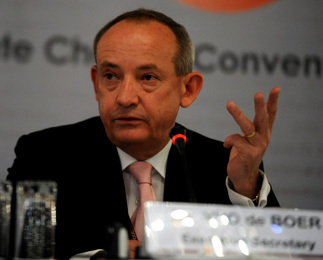 UNFCCC Executive Secretary Yvo de Boer answers questions from the press. 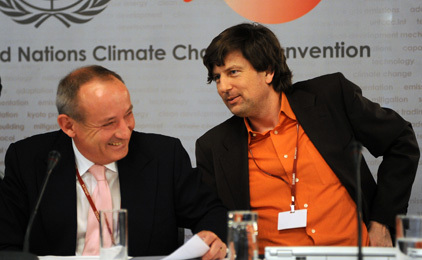 Climate Action Network prior to their afternoon press conference and with Yvo de Boer (right) after the conclusion of his press conference. 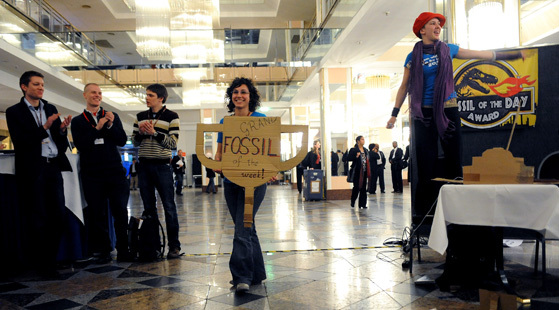 The Fossil of the Week award was given to Saudi Arabia.